MANILA, Philippines - The official results, list of passers, top examinees, performance of schools and other important announcements for November 2018 Civil Engineer board exams are released by the Professional Regulation Commission (PRC) Board of Civil Engineering four (4) working days after the board exams. 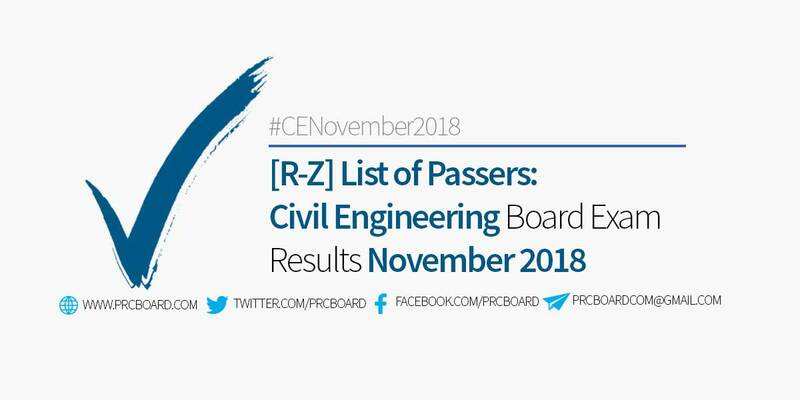 Below is the list of passers for November 2018 Civil Engineering (CE) board exams with surnames starting with letters R-Z. Thank you Lord for the victory that youve given to us. To God be the all the glory. papasa kam! in Jesus' name! amen! All glory and praises belongs to you our God. Congrats Engrs.